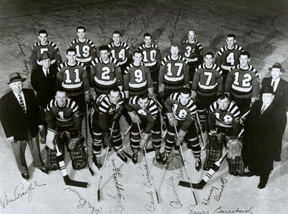 SIHR, consisting of nearly 500 worldwide hockey researchers and historians, published the award in its recent Hockey Research Journal, stating: “Led by Camille Henry’s 50 goals and Zellio Toppazzini’s 113 points (both tops in the AHL) the Reds went from worst (1954-55) to first in 1955-56.” The ranking included other minor teams in three separate minor league circuits. About thirty-five former Reds and other hockey pros are expected to attend the society’s weekend activities. Scheduled is a Saturday (Aug. 6) “Reds’ Night at the PawSox” starting at 4 PM that includes a baseball barbecue, hockey player introductions and, of course, the PawSox vs. the Buffalo Bisons. Sunday (Aug. 7) the society will host its annual cookout at Goddard State Park in Warwick that always attracts about 300 hockey fans. That event begins at 12 noon and players attending will disperse and sit at tables with fans. Both events are open to the public. Deadline for reservations for each is July 23. The charge is $35 per person for each event. The 1955-56 Rhode Island Reds finished first American Hockey League regular season and became Calder Cup champions.